I don't think Qiskit has this simulation feature. You have to decompose it indeed. However, there is another way to solve your problem. To check if a quantum circuit (that you can submit in Qiskit) corresponds to a unitary matrix, you can use the unitary_simulator backend. 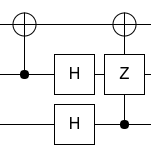 This will print the unitary matrix that your circuit represents. And you can compare to yours. I made it manually, by entering the matrix into Quirk, diagonalizing the matrix by adding operations, then simplifying the operations. It's not too hard to do by hand when all the operations are Clifford as in this case. One setback is that qubiter needs extra packages so installing could be troublesome. You can't directly build a gate from arbitrary matrices because custom gates need to be implemented using the build-in gates. You have to decompose your matrix to known gates. For a random two-qubit gate, there is two_qubit_kak. Not the answer you're looking for? Browse other questions tagged quantum-gate programming qiskit gate-synthesis or ask your own question. How do you represent the output of a quantum gate in terms of its basis vectors? How to properly write the action of a quantum gate implementing an operator $U$ on the superposition of its eigenvectors? Where is the factor of $-i$ in rotation gates coming from?